#13 On The NPR Top 100 Science Fiction Fantasy Books List. 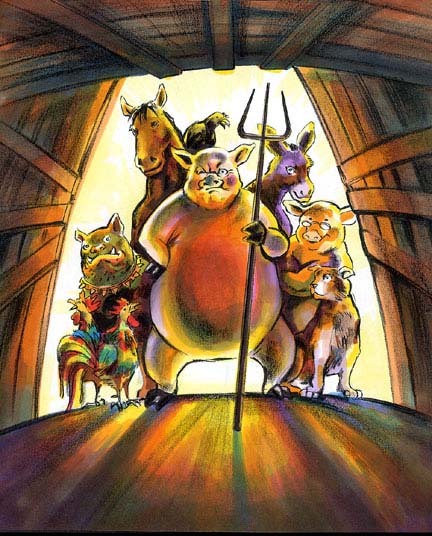 Animal Farm uses allegory to produce a political mockery that uncovers the evils of the Soviet system. The novel takes place on a farm located somewhere in England. The central characters are barn animals that have the capability to reason and speak; pigs, horses, sheep, cows, hens, geese, donkeys, and dogs to name a few. Old Major, a well-respected Boar was the first animal from Manor Farm with idea of rebelling. In a speech to the other animals, he states that he dreamt that they would one day be free from “the tyranny of human beings”. By working together he insists they can overthrow humans and eventually live by their own principles, gaining the full benefits of their labor. Mr. Jones (the farmer) forgets to feed them one day and then whips them for trying to find food themselves. This is the last straw for the animals; they rebel and overtake the farm surprisingly easy. After the rebellion, Napoleon and Snowball, two prominent pigs, step forth as leaders and establish a kind of government that has seven commandments that all animals must follow. They call their new government animalism. At first the animal run farm appears to be successful. The pigs however soon start to become corrupt with power. They start placing themselves above all the other animals. Eventually this corrupt leadership destroys the farm and leaves the animals in worse shape than they were when the farm was owned by Mr. Jones. "All animals are equal but some are more equal than others." Written in 1945, Animal Farm is Orwell's reference on political oppression, particularly under communist rules. The book is based on the Russian Revolution of 1917.Throughout the novel Orwell is able to show the complexities of the Russian revolution and makes the evils of communism painfully apparent. Czar Nicholas II is represented by farmer Jones the original owner of Manor Farm, and the animals the Russian people. Much like the Russian proletariat banning together to oust the Czar, Farmer Jones' poor treatment of the animals leads to the uprising. Old Major, whose dream sparked the revolution, represents revolutionary leader Vladimir Lenin as promoter. After the death of Old Major, the revolution occurs and two pigs arise as leaders, Napoleon and Snowball. Napoleon represents Joseph Stalin and Snowball Leon Trotsky. In an attempt to eliminate his political rivalries Napoleon exiles Snowball from the farm just as Trotsky was ousted from the Soviet Union by Stalin. Napoleon then becomes more oppressive. He forces the animals to work long hard days and feeds them less. He lives in farmer Jones’ house apart from the other animals in the barn, and has a crew of vicious dogs to protect him. Eventually he ends up altering the seven commandments secretly, and even starts murdering animals for crimes they did not do. The rest of the animals on the farm represent the gullible working class of the Soviet Union, eager to please but lacking the intelligence to see the truth. Every event on the farm equals a moment in Russian history, from the animal’s revolution to Napoleon's thought out brainwashing of his loyal followers. The final scene of the novel shows the pigs eating dinner with humans inside the house. The rest of the animals gather outside the window of the house and when they look inside they are unable to make the distinction between man and animal. The first time I read this novel was in high school, wanting a relatively short and easy read. While reading the book I thought of it as humorous talking animal story. After some further review however I came to realize it is so much more. When you compare the novel with the Russian revolution the similarities are immense. George Orwell does an amazing job incorporating the Russian revolution into a novel one could read and enjoy without knowing the storyline actually comes from real life events. These varying perspectives are what make this novel so great in my opinion. The use of a farm, something very easily understood by most people to explain the vast complex workings of communism is very clever. It is this ability that has made George Orwell one of the most renowned writers in the world. However with all this books strengths come some weaknesses. At times the story line seems to move very slowly and can even get a little boring in some places. These dull sections are normally short lived however and the story picks up nicely once again. I also found the novel hard to follow at some points. Overall I would definitely recommend this book to anybody. It is a great read and you just might learn a little history while you are at it. "Animal Farm Book Review." Bookstove. Web. 24 Apr. 2012. <http://bookstove.com/classics/animal-farm-book-review/>. "Animal Farm." Histoforum, De Site Voor Geschiedenis En Ict. Web. 24 Apr. 2012. <http://histoforum.digischool.nl/lesmateriaal/animalfarmextra.htm>. ""Animal Farm" SUMMARY/OVERVIEW -- George Orwell's "Animal Farm" ... from 60second RecapÂ®." YouTube. YouTube, 28 Feb. 2010. Web. 24 Apr. 2012. <http://www.youtube.com/watch?v=_dI1YO3EGYs>. "Book Review: Animal Farm by George Orwell." Yahoo! Contributor Network. Web. 24 Apr. 2012. <http://voices.yahoo.com/book-review-animal-farm-george-orwell-44940.html>. Orwell, George. Animal Farm;. New York: Harcourt, Brace, 1954. Print. "Work : Summaries & Interpretations : Animal Farm." // George Orwell // Www.k-1.com/Orwell. Web. 24 Apr. 2012. <http://www.k-1.com/Orwell/site/work/summaries/animf.html>.